Situated half way up the High Street in Kinross, you can always be sure of a cheery welcome when you visit the shop. Open Monday to Friday 7.30am to 5.15pm and Saturday 7.30am to 4.30pm, whether you are a regular customer or new to the shop, popping in to grab a sausage roll or buying a piece of prime fillet of Scotch Beef, we will always be happy to see you. We’ve all had those days where we can’t think what to make for dinner. Whether you’re short of time, bored of eating the same things, or planning a celebration meal, it can be stressful trying to think of nutritious, healthy and tasty food that you can prepare in time and that fits the occasion and your budget. A visit to Hunters of Kinross will give you plenty ideas, and if you’re still stuck just ask for our help. Whether you have 20 minutes to whip up dinner for the kids, and you don’t want to resort to pre-packed supermarket ready meals, or you have a little more time but a limited budget we have plenty options for you. We cut all our meat in the shop, and have a huge variety of cuts of Scotch Beef, Scotch Lamb, Specially Selected Pork, poultry, seasonal wild venison and game all on display in our chilled cabinets. If you don’t see what you want, or you want your meat cut differently just say the word and one of our skilled butchers will cut to your specification on the butcher's block while you watch. We are proud both of the quality of our meat, the welfare standards that are achieved by all our suppliers, and our butchers’ skills, and are always happy to oblige specific requests. As well as our wide selection of meats, we have an ever expanding range of handmade ready to cook dishes that are quick and easy to prepare with minimal fuss and mess. They are delicious! Sold in microwaveable foil containers and only ever containing the high quality, high welfare meat that we stock in the shop, all you have to do is pop them in the microwave or the oven and enjoy. You won’t even have to wash up pots and pans! We’re also happy to put chops, sausages, beef olives or anything else you fancy into a tray so it’s easy as pie to cook. Alternatively, how about pick and mix? We have a range of sauces that we can put over any meat. Choose from sweet chilli sauce, sweet and sour sauce, plum sauce, mango and chilli sauce, authentic Japanese terriyake sauce, authentic Japanese yakinuke sauce or authentic Japanese black pepper sauce to name but a few, then select your meat or kebab and we will do the rest. We make lentil soup with smoked ham ribs and fresh local veg, macaroni cheese, chicken pies, mince rounds, steak pies, cottage pies. All are precooked and simply need to be reheated – it doesn’t get any easier or tastier! The following products are gluten free: traditional Scotch Beef sausages; gold award winning Specially Selected Pork sausages; slice sausage; and our two rump steak burgers - the original and the gold award winning 6oz burger. We have a wide range of cold meats, most of which are cooked on the premises. Equally good in a sandwich for lunch or with salad and potatoes for dinner, you can take your pick from roast, baked and boiled hams, roast beef, lamb, pork and chicken, potted meat, corned beef, tongue, chopped pork, turkey breast and Hunter's own recipe meat loaf. Everyone loves a cooked breakfast, and here at Hunters of Kinross we have everything that you need to kick start your day. As well as our specially selected smoked and unsmoked Ayrshire bacon; Hunter’s pork, beef and Lorne sausages; Hunter’s black and white pudding and Hunter’s haggis, we also sell free range eggs, fresh mushrooms and tomatoes, and we bake rolls in the shop every morning. You can even grab a pint of milk for your tea! Not got time to cook a full breakfast? We’ve got that covered too! Why not try our breakfast sausages, the brain child of Myra Taylor who won our competition to come up with a new sausage recipe. Containing Specially Selected Pork chipolatas, Ayrshire smoked bacon and our own recipe black pudding they have proved to be a big hit with our customers. And if you don’t want to cook at all, how about a breakfast pie? Free range egg, Ayrshire smoked bacon, Hunter’s chipolata sausage, black pudding and white pudding, topped with fresh tomato all in a pastry shell, cooked and ready to eat straight out of the shop. We don’t think it gets much easier than that! 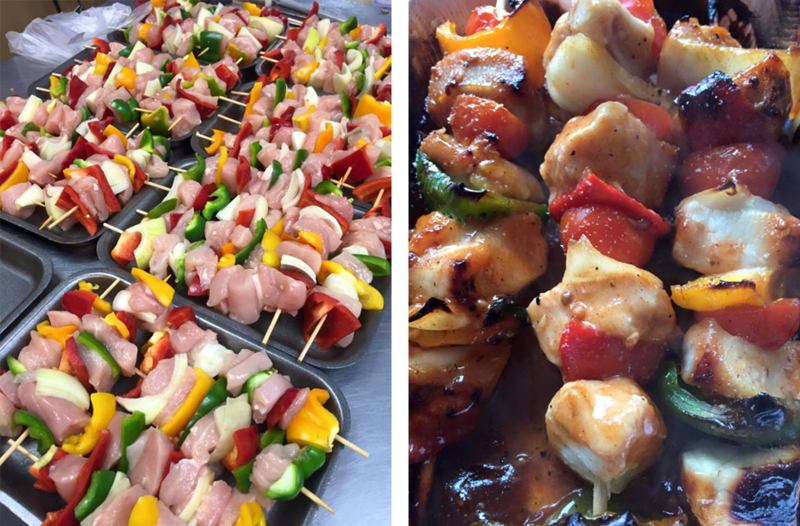 If you are catering for a larger group we can take orders and deliver them to you or have them ready for you to pick up on the designated day. Kebabs, sausages, burgers, sheets of ribs, steaks, even a whole pig for a hog roast! Just get in touch and discuss your requirements with us. We can make up freezer packs to your specification. We will cut, pack and label all items before blast freezing and delivering to your door. We offer a discount on all freezer orders, just call the shop or pop in to discuss your requirements with Iain. Yup, that’s what our junior customers call us! With your permission children visiting the shop get a little fudge to keep them sweet.